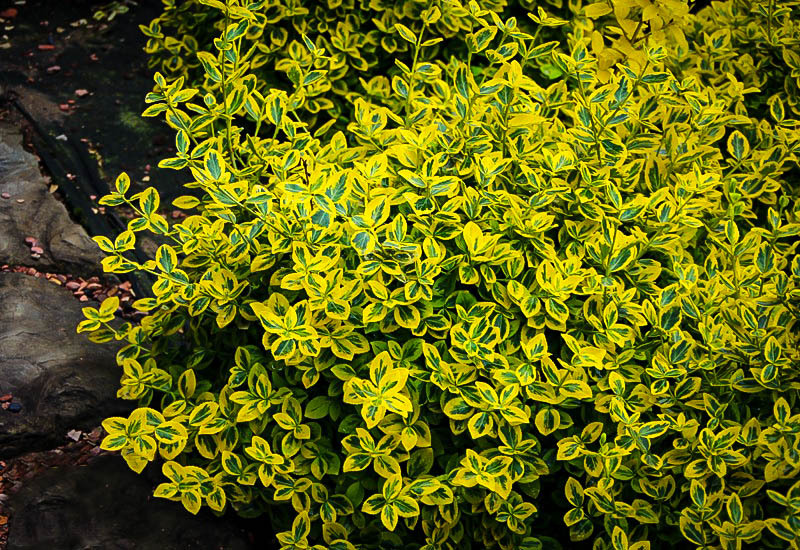 Variegated plants are a great way to bring color all-year-round to your garden, and when you find such a plant that is as happy in shade as it is in full sun, you know you have a winner. 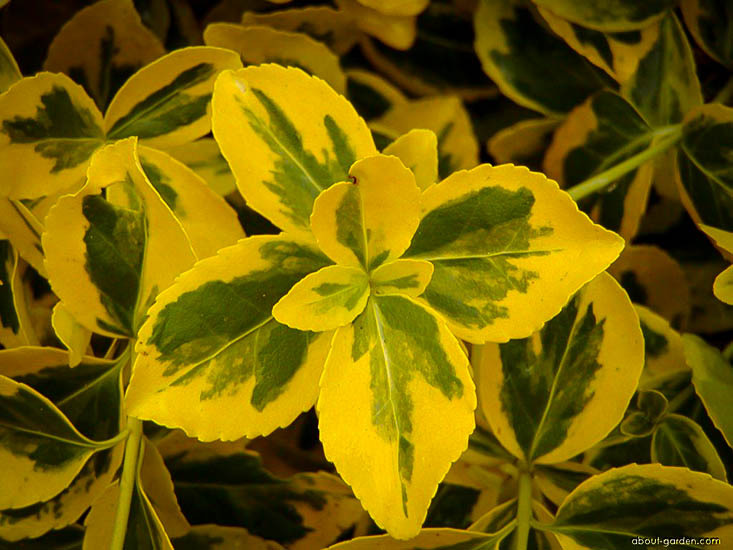 The Emerald ‘n’ Gold Euonymus has been proving its value in gardens for a longtime and no wonder – its bright variegated leaves are just the start for a shrub that has so many uses around the garden. 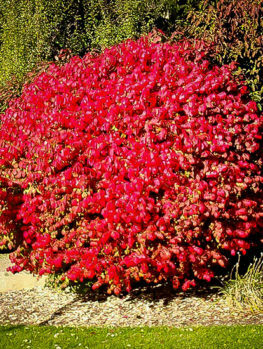 Grow it as a ground-cover in shade or sun, as an accent plant among other shrubs or as a covering for a low wall, this trouble-free plant will always look just great every day of the year. There is no denying that choosing plants is fun, but it is very easy to focus entirely on summer blooms, scents and fruits while forgetting that come fall and winter, these things will no longer be around to create interest in your garden. 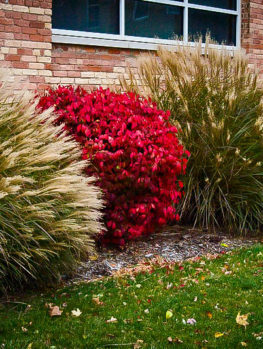 Evergreen planting can provide color and shape that carry the lushness of your garden all through the year, preventing the barren look that can sometimes occur when evergreens have been omitted. 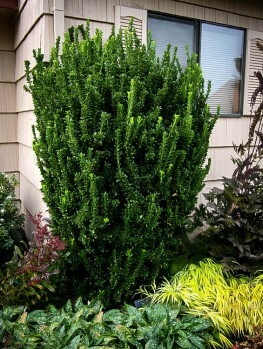 Of course, in this case, evergreen and gold would be more appropriate, as this lovely plant will bring exactly that to your landscape. 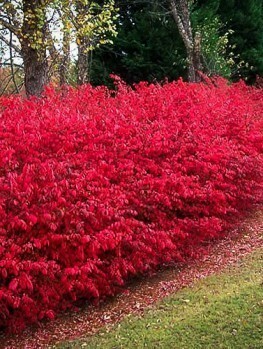 There are also some in colder regions that will find the leaves of their shrub taking on a pink and burgundy hue in the colder months. 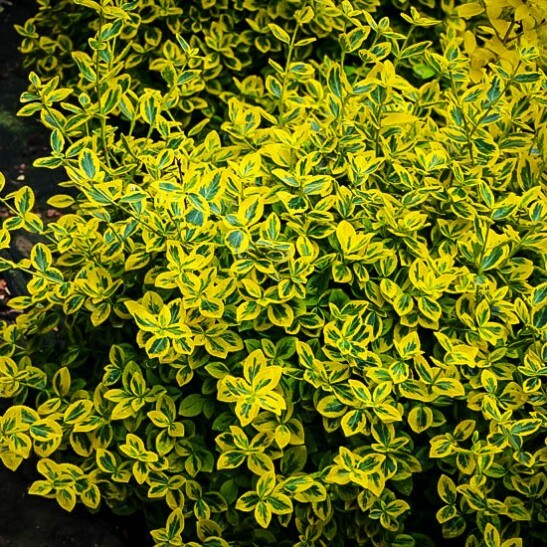 So whether you choose to leave your ‘Emerald ‘n Gold’ to do as it pleases, plant it beside a fence or trellis to clamber, or prune to form a highly compact and dense multi-colored shrub, there is no doubt that its characteristics make it an asset to any landscape. Plants from the Euonymus group are originally native to East Asia and the Himalayas, but are now found all over the world in various cultivars. One such cultivar is radicans, with which this variety must not be confused, as radicans is extremely aggressive; it is highly recommended that it not be domestically planted in many areas due to its ability to spread, and its climbing nature being such that it can throttle trees. As scary as that sounds, it can be safely said that ‘Emerald ‘n Gold’ does not display these habits and you are not going to lose your garden to it; a bit of pruning will keep it in check without much trouble at all. 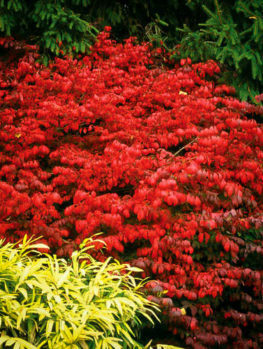 A good amount of pruning will also assist you on your way to a solid bush, when another aspect of this bright plant comes to the fore; older leaves tend to darken as the age, with the gold becoming less prominent, and this is most noticeable on compact examples as it gives the fabulous of effect of the darker leaves at the bottom of the plant and the more golden new growth at the top. Something to keep an eye on, as with any variegated plant, is the appearance of new stems that bear only the dark green and have no golden tones at all; if these appear – and they probably will – then snip them off straight away so as not to influence the rest of the plant. You are not going to damage the plant, just ensure that new growth is of the green and gold variety. There is another small point worth mentioning; as appealing and attractive as these plants are and as unlikely as it is that you might take it upon yourself to collect some clippings and sprinkle them liberally upon your salad, just in case, don’t! These are poisonous plants both in the leaves and the stems so this is something that is always worth knowing. So what other things should you think about when selecting the perfect spot in your garden? The most ideal conditions for ‘Emerald ‘n Gold’ are well drained and moist sites in full sun; this is where it will truly flourish. The reality is, however, that full sun, partial sun, partial shade and even full shade are tolerated so that is one thing you do not have to worry about. What of soil; Sandy, loamy, clay, poor quality, high quality? All of these things matter not a jot to our variegated friend ,who really is only concerned about there being too much water, so well drained is the only important factor when selecting the position and boggy is not favored at all. It probably will not surprise you to learn that pruning is something that can be undertaken without causing any trauma to the plant. The best time to prune in order to encourage a stocky, dense bush is early spring when you can take back the plant by about one third. This will encourage the production of more stems and more compact growth. To keep it tidy, you can trim stragglers as and when you see them throughout the year keeping an eye out for the belligerent wholly green ones. 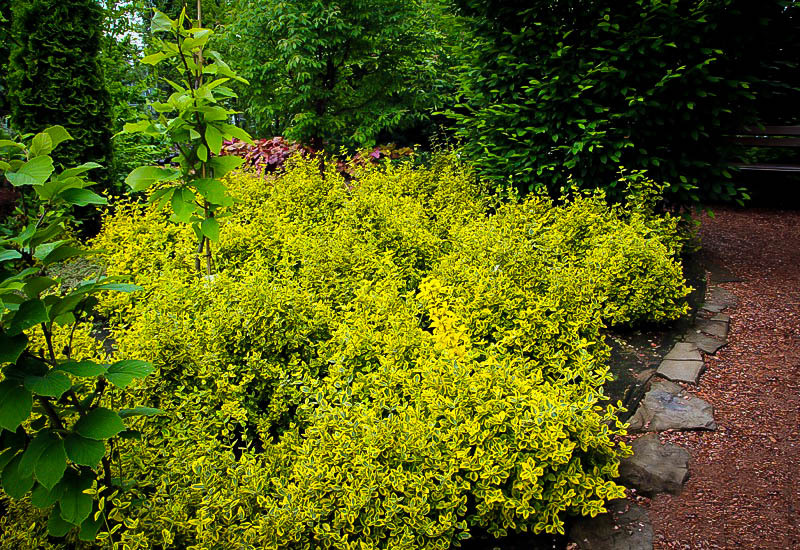 So provided you do not eat it or drown it, Emerald ‘n Gold Euonymus Shrubs are a fantastic addition to any garden, requiring no special treatment or conditions. This plant has a wide range of uses – from tidy bush to unruly creeping shrub and low clambering vine. 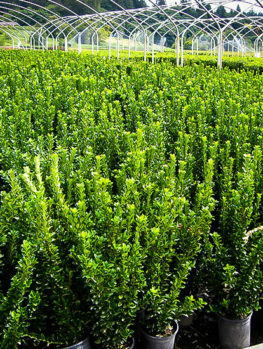 It is tough and fun, and although the Latin euonymus loosely translates as luck that is not something you will need to see success with this lucky plant.